Paul makes a welcome return to the Pivotal Podcast this week and our very special guest is Andy Buck. Originally a geography teacher, head of year and head of department, Andy went on to become a headteacher in east London for thirteen years. In the last year of headship, his school was judged outstanding in all categories and Andy was designated a National Leader of Education. In 2009 he become a Director at the National College for School Leadership, leading on the London Challenge programme. He was subsequently responsible for setting up the government’s flagship Teaching Schools programme before being appointed as Managing Director at United Learning, one of the country’s largest academy groups. Since 2014, Andy has founded two organisations: Leadership Matters and #honk. Both aim to improve the educational outcomes for pupils by supporting great leadership development. Leadership Matters is a web-based membership organisation which offers school leaders access to high quality online development tools and other leadership articles, videos and blogs. 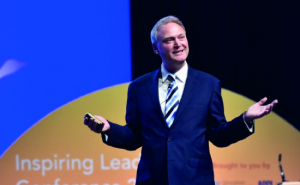 #honk is the organisation through which Andy works directly with educational leaders on executive coaching, team development, training and conference keynotes. Andy was invited to become a Fellow of the RSA in 2015. He has also been a Board member for various organisations including the Teacher Training Agency, the National College for School Leadership and Partnerships for Schools. 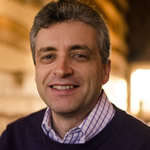 He is currently a Trustee for the Teacher Development Trust, Board member at the Teaching Awards and is the Dean of the Leadership Faculty at Teaching Leaders. How did you find yourself standing in front of a class of children? Originally when he was a t school, Andy did want to be a teacher but it wasn’t until a screening of Out of Africa’ years later that the idea resurfaced and he trained to be a Geography teacher. Andy knew when he started teaching that he wanted to be a head. He’s not sure how much that happens nowadays. Headteachers are now subject to so much accountability that they have that worry ‘sitting on their shoulder’ the whole time. However, the best leaders he sees in school still manage to remember what they care about and build in time to nourish themselves which means that they get a feeling of making a difference and doing what they are good at. This is infectious and spreads to the whole staff. What do schools need to do to grow capacity and develop their own leaders? Andy believes that the basis of this is culture and climate, combined with care – leaders need to care for their staff and look out for them. They need to notice and recognise when they are doing great things and noticing when they don’t seem quite themselves. If people understand why they are doing something also be encouraged and supported to be ‘up to something’ then the climate improves and develops. For Andy, there are many parallels between great classroom teaching and great leadership, for example in talent management – helping people to grow, just like children in a class. Andy believes that to lead a school you need to have experience of teaching because schools are complex, you need to have credibility with the people you are leading and really to understand what the role is. Experience is a product of time but different people need different amounts of time to develop. He thinks that roles higher up in, for example, an academy chain are different and teaching experience isn’t necessarily essential for those, as long as they surround themselves with plenty of good people with that experience. Do schools at different stages of their development need different kinds of leadership? Andy believes they do and sometimes that means a different kind of leader. Leaders also need to understand the situation they are leading in and then they can work out how they need to lead – what approaches they need to take. For example, a school in difficulties needs someone to come along and say, ‘Look, this is what we need to do’. If you took that same pace-setting approach in a school where there is a lot of experience, people are motivated and performance is good, they will wonder why they need to change, and ask themselves if the leader understands that things are going well. The leadership style will need to be more about taking time to talk to people, to coach, to be more democratic with decision-making and to empower and delegate. As a leader you may be more predisposed towards one type of leadership and you need to understand that to be most successful you need to be aware of this. How do you motivate a staff who are facing budget cuts and redundancies? Andy says this is not easy. Leaders need to acknowledge that it’s difficult. Andy believes that transparency breeds trust so he advocates as much transparency as possible in these situations. Leaders also need to preserve their optimism despite everything which is going on. Andy also covers Grammar Schools and a range of other topics, so do listen to the whole episode!